The historical and classic dessert is located in the central part of Iran. These deserts with their mysterious silence attract those who love profound inexplicable beauties of nature, architecture and pilgrimage. The old city is emerged like a phoenix from the dessert. Make sure you see the place in detail it deserves. Minarates and a load of courtyard style houses with ancient wind catchers in them, they are known as Badgris. The streets are all narrow, marvelous walls everywhere, underground water channels called Qanats (Qanat is an irrigation system) by which underground mountain water is tapped and the water channeled down through a series of tunnels to the town that flow freely through the city. 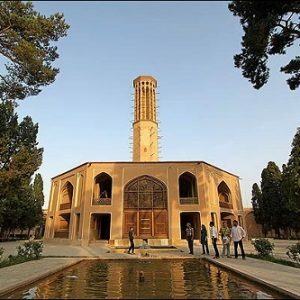 Yazd is also very well known for Zoroastrians fire temples, Ateshkadeh, (Alexander Prison), Dakhmeh-ye Zartoshtiyun, Saheb A Zaman dub Zurkhaneh, Bogheh-ye Sayyed Rokhaddin, as well as Persian handicrafts, silk weaving and its high quality confectionary. The stunning three-story façade of this complex makes it one of the largest structures in Iran. 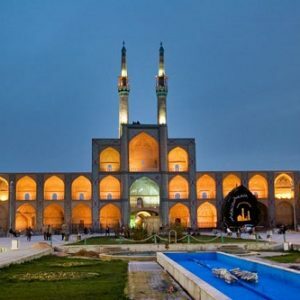 This complex consists of a mosque, a public bath, a caravansary, a mausoleum, a Tekye (a religious place for mourning), three water reservoirs and a bazaar, each of which having its own beauty. 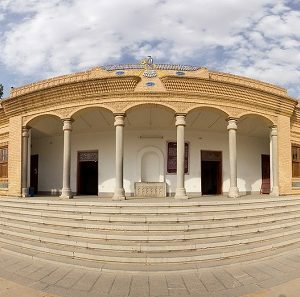 Zoroastrians come from around the world to see this ateshkadeh (Fire Temple) and said to have been burning since about 470 AD. This temple is encircled by evergreen trees. A large round pool increases its attractiveness. In the Fire-Temple there is a fire which has been burning since 700 years ago, around which there are rooms for blessings. The architecture of this historical monument is to some extent similar to the architecture of the Persian fire temple in India. A very strange feeling is dominant in this temple which no one will forget in his lifetime. This complex Comprising a large garden and some buildings, it is a famous complex built in the original Iranian style which is watered by a qanat of this same name. In the past, it was the residence of the governor. The most impressive part of this complex is a building with a ventilation structure (bawdgir) on the roof and a brook in the interior. The air, passing through the bawdgir, is conducted to the flowing water to cool the interior. Being 33 meters high this bawdgir is an architectural triumph. Lattice doors and windows covered with colored glass afford a pleasing sight to the building. 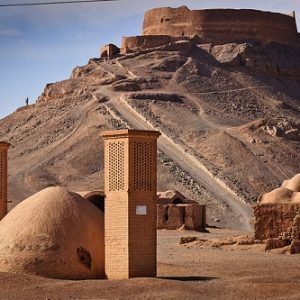 The Tower of Silence set in two lonely, barren hill tops on the southern outskirts of Yazd are the evocative Zoroastrian Tower. A circular, raised structure used by the Zoroastrians for the exposure of their dead. There is no standard technical name for such a construction. The common crypt (Dakhme in Farsi) originally denoted any place for the dead.